Wishaw based TFG Sports took over from Olympic Sportswear in the close season of 2000, agreeing a three year contract to supply United with kits, and they kicked off with the Centenary Collection - a range of kits that would be redesigned and themed on specific aspects of the Club's heritage, building towards the Club's 100th anniversary in 2009. Commercial Manager Bill Campbell said of the new range, "The emphasis will be on providing attractive, high-quality sportswear and we’re hopeful that these strips will become collector’s items." For the Away top, United were to wear green for the first time since Dundee Hibernian changed to white shirts in 1923. The plain green shirt had a tangerine trim running from the collar to the armpit, and the black V neck was enhanced with a turnover collar, with a white trim on the lapels. As a departure from the norm, the manufacturers logo and the Club badge were placed in the centre of the chest, instead of on each breast, with the Club badge printed on a sewn on panel with the words "Centenary Collection" along the top. 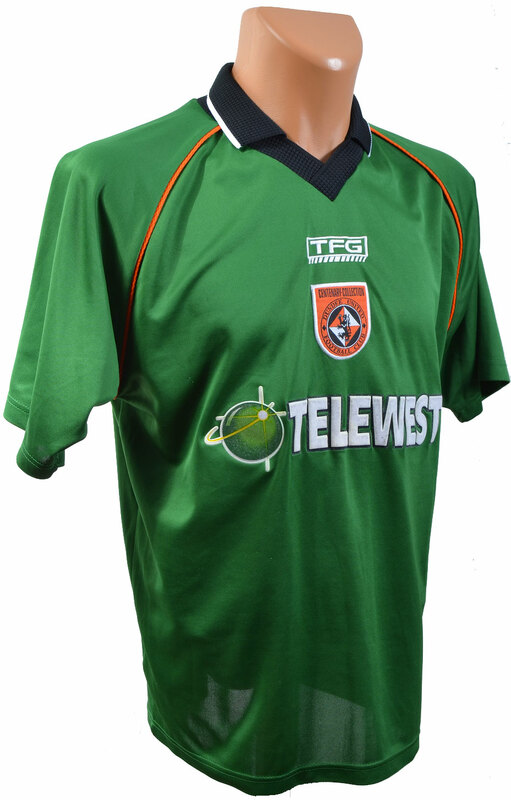 The Telewest logo from the past two seasons remained, with the larger black text and white outline accompanying the familiar green sphere. The green shirt was worn with white shorts with a thin tangerine pinstripe down each side, and white socks. 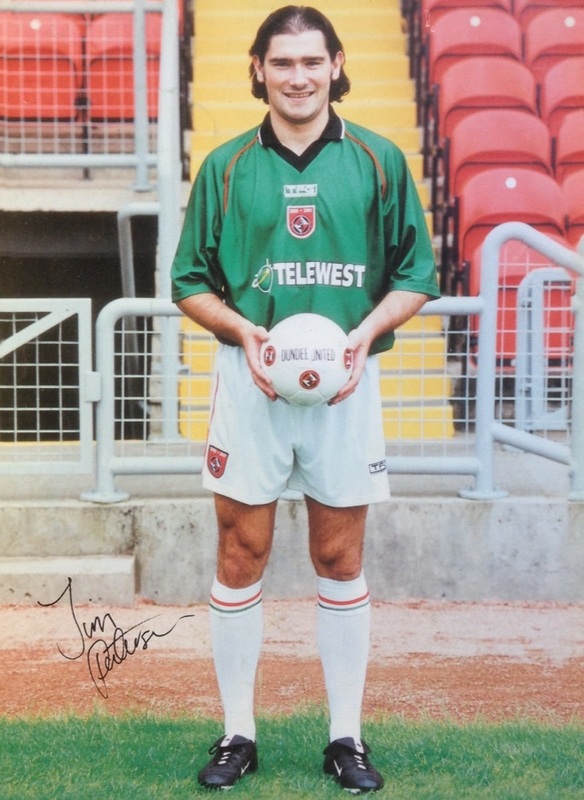 Just like the final game of the previous season, United played Celtic at Tannadice in the opening match of the 2000/01 season in their change strip, with Celtic also playing in yellow, as United lost out narrowly. Just weeks later, Paul Sturrock stepped down as manager, to be replaced with Alex Smith. Months later, Jim McLean was forced to step down as Chairman after an altercation with a BBC reporter, and the team also had a horrific time on the pitch, taking four months to win their first League match, with the green shirt being worn in the 3-2 victory over Dunfermline at Tannadice in November. The team managed to turn their form around in the second half of the season, surviving a relegation battle with St Mirren, to confirm the Club’s SPL status.